Through interactive activities and video demonstrations you will leave this workshop inspired with a wealth of highly proactive and effective strategies to transform the social emotional health of your classroom. You will immediately be able to help your students develop responsibility for their own behavior and learning and contribute to a positive classroom environment! Differentiate between a growth versus fixed mindset and implement interventions to support the development of a growth mindset in students. Utilize structure in the classroom to create a positive learning environment that fosters teamwork and helps students to develop prosocial behavior and relationships with peers and adults. Implement instructional intervention strategies to support students’ social-emotional learning as it relates to frustration management, impulse control and perseverance to achieve personal and educational goals. Develop an explicit instructional plan for students to model positive self-talk and self-reflection on a behavior/task. 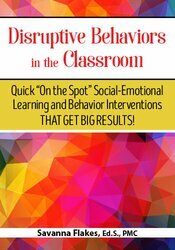 Analyze common student behaviors and demonstrate the application of a positive behavioral strategy to facilitate social-emotional learning skills. Utilize educational strategies based on brain research that address neurodiversity among learners and increase engagement and motivation. Savanna Flakes, Ed.S., PMC, is an engaging and enthusiastic international presenter who believes that every child has talents to offer and can be a contributing member in our classroom, school, and society. She is an award-winning teacher, experienced instructional leader, and educational consultant who has taught a variety of subjects and led professional development for multiple school levels on a range of topics such as differentiation, literacy interventions, inclusion, co-teaching, and specially designed instruction. She holds an Education Specialist Degree in Administration Leadership, Curriculum and Instruction: Literacy, and Special Education. She is a National Board Certified Teacher (NBPTS), an International Education Technology Standards Certified Teacher (ISTE), a Google Certified Educator, and the author of the Inclusion Instructional Strategies Corner for MultiBriefs. Educators who have worked with Savanna in the past have often commented on her experience and knowledge of differentiated instructional strategies to ensure every learner has access to the curriculum and is ready for 21st century success. Financial: Savanna Flakes is CEO for Inclusion for a Better Future, LLC. She receives a speaking honorarium from PESI, Inc. Non-financial: Savanna Flakes has no relevant non-financial relationship to disclose. This course consists of 6.25 self-study clock hours. Credit requirements and approvals vary per state board regulations. Please save the course outline, the certificate of completion you receive from this self-study activity and contact your state board or organization to determine specific filing requirements. 6.0 ISBE Professional Development (PD) Clock Hours will be made available through Quincy University. Those requesting ISBE PD Clock Hours will need to complete additional steps in order to receive the ISBE “Evidence of Completion for Professional Development” form. Expires: 06/30/20**. Indiana Educators: 6.0 Professional Growth Points are available for full attendance of this self-study package per the Indiana Department of Education standards. Montana Educators: This self-study package is offered for 6.0 Renewal Units. PESI, Inc. is an Approved Renewal Unit Provider with the Montana Office of Public Instruction. New Jersey Educators, Administrators & Education Services Personnel: 6.0 Actual Professional Development Hours (self-study). MEDS-PDN, powered by PESI, Inc., is a registered New Jersey Professional Development Provider with the NJ Dept of Education. Texas Educators: PESI, Inc., has been approved as a CPE Provider #500-981 for Texas Educators by the Texas State Board for Educator Certification (SBED). This self-study package qualifies for 6.0 CPE clock hours. PESI, Inc. is an AOTA Approved Provider of continuing education. Provider #: 3322. This self-study course qualifies for 6.0 self-study contact hours or .6 CEUs in the Category of Domain of OT and Occupational Therapy Process. The assignment of AOTA CEUs does not imply endorsement of specific course content, products, or clinical procedures by AOTA. Course Level: Intermediate. Expires: 3/16/2020. Florida Occupational Therapists & Occupational Therapy Assistant: PESI, Inc. is an approved provider with the Florida Board of Occupational Therapy. Provider Number 50-399. This self-study course qualifies for 6.3 continuing education credits. This self-study activity consists of 6.25 clock hours of continuing education instruction. Credit requirements and approvals vary per state board regulations. Please save the course outline and the certificate of completion you receive from this self-study activity. Contact us for more information on your state board or organization specific filing requirements. American Psychological Association credits are not available. Canadian Psychologists: PESI, Inc. is approved by the Canadian Psychological Association to offer continuing education for psychologists. PESI, Inc. maintains responsibility for the program. This program is approved for 6.0 self-study continuing education hours. This course contains 6.0 hours of self-study continuing education. It was not offered for ASHA CEUs. Please retain your certificate of completion. If audited for ASHA Certification Maintenance, you can submit this certificate of completion at that time. For state licensure, teacher certification renewal, or other credential renewal, contact those agencies for information about your reporting responsibilities and requirements. California Speech-Language Pathologists/Audiologists: PESI, Inc. is an approved provider with the California Speech-Language Pathology and Audiology Board, #PDP 319. This course meets the qualifications for 6.0 hours of self-study continuing professional development credit for Speech-Language Pathologists or Audiologists, as required by the California Speech-Language Pathology and Audiology Board. Kansas Speech-Language Pathologists: Approved for 7.5 self-study continuing education clock hours for Kansas licensed Speech-Language Pathologists by the Kansas Department for Aging and Disability Services.